Humsaye Ma Jaye uses everyday language to question the high-octane war rhetoric. Viral in Pakistan, the video is gaining traction in India. New Delhi: Amid the tensions between India and Pakistan, a viral music video seeks to unite the people of the nuclear-armed nations in a way that only music, art and women can. In a Punjabi rap video Humsaye Ma Jaye released earlier this month, a Pakistani sister-trio — Neelum Bashir, Bushra Ansari and Asma Abbas — at once question the inanity of high-octane war rhetoric and its relevance to ordinary people whose lives are weaved together by a shared history, neighbourhood and companionship. They do so in a way that is innocent, yet layered. This seemingly apolitical conversation between two housewives is already viral in Pakistan. The video is now beginning to get massive traction across India. 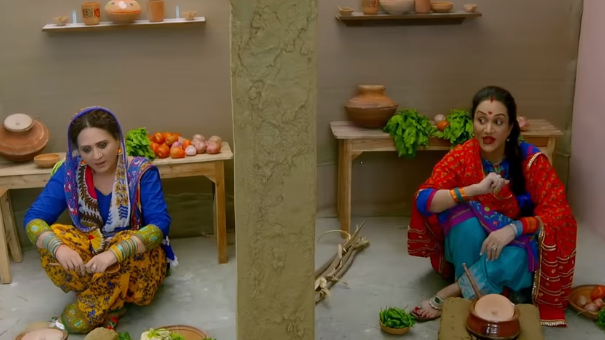 The video depicts two women — one Indian, played by Bushra, and the other Pakistani, played by her sister, Asma — separated by an insurmountable wall. The worlds they inhabit, the worries that confront them, the language that they speak are all the same. Their difference is only betrayed by the flags of their countries hanging in the backdrops of their homes. As they go on through the mundanities of everyday life, the two women tell each other how they have “heard” that they are each others’ enemies. They don’t quite specify where they have heard this from — underscoring how most of the hate generated in today’s times is faceless and anonymous and yet considered as gospel truth by those who consume it. But they are quick to dismiss the imagined enmity for what it is — political deflection — and come to the more immediate questions facing them like what should be cooked today. At one level, the two women are victims of the jingoism and the restrictions that surround them. No matter how much their heart aches to see and embrace each other, the wall that separates them remains insurmountable. But that neither affects their friendship nor their commitment to remain friends despite belonging to “enemy” countries. When they realise that they cannot see each other, the two exchange and don each others’ dupattas even as the sounds of bombing fills up their neighbourhood. “The two pieces of cloth are symbols of respect in both our cultures… So that exchange is symbolic,” says Bushra. The audience is free to then conclude whether it is the women who are helpless in the face of their governments, or it is the state which is helpless in the face of ordinary people whose minds and hearts it cannot tame. Daughters of late Pakistani journalist Ahmad Bashir, the three sisters come from a family of writers, poets and artists. Bushra Ansari is, of course, a star in Pakistan. Theatre, television, music, production and comedy – Bushra has straddled several spheres. Her sister Asma who is relatively new to performing arts too is an actress and plays the role of the Pakistani woman in the video. “Neelum belongs to the world of literature, so she wrote the lyrics… We thought to spread the message, Asma and I should perform it,” Bushra says. Days after the release of the video on Bushra’s YouTube channel, her phone has not stopped buzzing. “I am getting so much love from both the countries…None of us had imagined that our message of love will go so viral,” she says. But have they been trolled for wanting peace with an “enemy” country? “When we put out the video I told my daughter I don’t want to read any negativity,” Bushra says. The comments for this video are therefore disabled. “But still some trolling reaches us nevertheless… Some are calling me an Indian agent, some are shaming me for dancing with abandon even though I am a grandmother,” she says. Next articleIs #MeToo casting a shadow on sexual pleasure?